At Old Dominion Animal Hospital, our in-house Charlottesville veterinary pharmacy was created for our clients’ convenience with the goal of ensuring the consistency and quality of the medications your pet needs. By using our veterinary pharmacy, our veterinarians are able to keep medical records of every medication your pet is taking and guarantee the quality of the products. 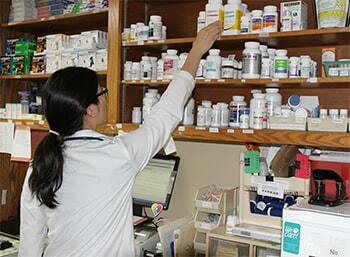 Our pharmacy is convenient too – please just call or email our Charlottesville pet clinic and we will have your prescriptions available for you to pick up. Old Dominion Animal Hospital is also pleased to offer veterinary prescription services through our on-line pharmacy 24 hours a day, 7 days a week. It couldn’t be simpler. Just enter the on-line pharmacy through your pet’s PET PORTAL and browse medications and supplies. You can place your order and have it delivered directly to your home!